Advances in Inorganic Chemistry presents timely and informative summaries of the current progress in a variety of subject areas within inorganic chemistry, ranging from bioinorganic to solid state. This acclaimed serial features reviews written by experts in the area and is an indispensable reference to advanced researchers. 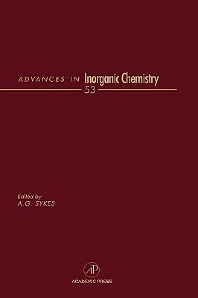 Each volume of Advances in Inorganic Chemistry contains an index, and each chapter is fully referenced. Academic and industrial inorganic chemists and biochemists. The University of Newcastle upon Tyne, U.K.